Respondents think the president-elect will take action on Obamacare, infrastructure and taxes but won’t build a wall on the southern border. President-elect Donald Trump’s public image has notably improved since winning the presidency in November, according to the latest George Washington University Battleground Poll. 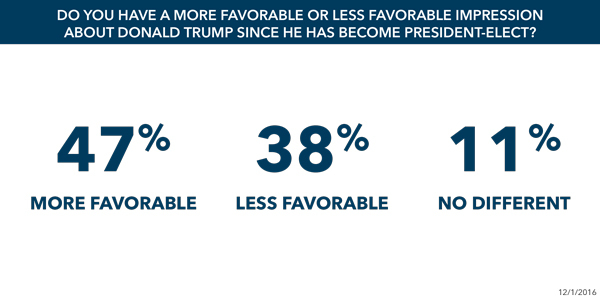 Of the voters surveyed, 45 percent had a favorable opinion of the president-elect, while 49 percent viewed him negatively. This represents a large swing from the last edition of the GW Battleground Poll in mid-October, when only 36 percent rated favorably and 61 percent were unfavorable. Mr. Trump’s rising approval rate may have been helped by media coverage. About 47 percent of those polled said what they have seen, read or heard about Mr. Trump since the election has improved their impression of him. Eleven percent said it made no difference, and 38 percent said it gave them a less favorable impression. Looking forward, voters were evenly split on their general outlook on Mr. Trump’s presidency. Asked about the new shift to Republican Party control of the executive and legislative branches of government, 49 percent said they felt either concerned or scared, and 47 percent responded they were excited or hopeful. “It's clear that the campaigns and the election results have jarred the nation,” said Michael Cornfield, associate professor at GW’s Graduate School of Political Management and research director of GW’s Center for Political Management. That divided attitude carried through to voters’ projections of whether they think Mr. Trump will actually achieve some of his trademark policy proposals. Poll respondents were asked to judge the likelihood of action on several issues now that there will be Republican control of the White House and both chambers of Congress. Most people were doubtful about the prospects of building a wall on the U.S.-Mexico border; 55 percent said it was not very or not at all likely and 41 percent said it was very or somewhat likely. People thought there was a much better chance of the Affordable Care Act being repealed and replaced with an alternative: 79 percent chose “very” or “somewhat” likely; 17 percent chose “not very” or “not at all” likely. They also projected good odds for Mr. Trump’s infrastructure plans (66 percent chose “very” or “somewhat” likely, 31 percent chose “not very” or “not at all” likely) and tax code reform (71 percent chose “very” or “somewhat” likely, 24 percent chose “not very” or “not at all” likely). “Voters will be watching Mr. Trump’s actions closely. While many Americans may be pleased by Mr. Trump’s seeming evolution on such issues as climate change and torture, those words will need to be backed up by deeds in order to convince a skeptical public of his intentions, abilities and willingness to disappoint his party’s base,” said pollster Celinda Lake, president of Lake Research Partners. 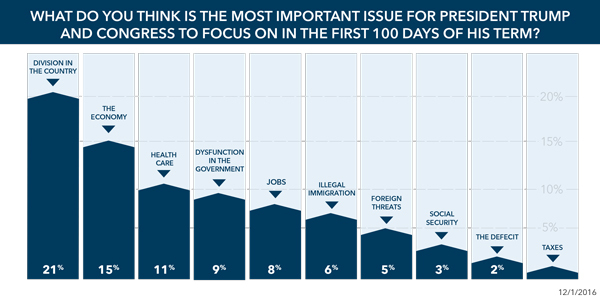 Voters were also asked what topics they considered most important for Trump and Congress to focus on within the first 100 days of the new administration. Given an array of choices, division in the country (21 percent) and the economy and jobs (15 and 8 respectively, 23 combined) tied for the most important issues for voters, followed by health care (11). Respondents were also asked to pick a second choice. The economy and jobs (18 and 11 percent) combined to lead that list. 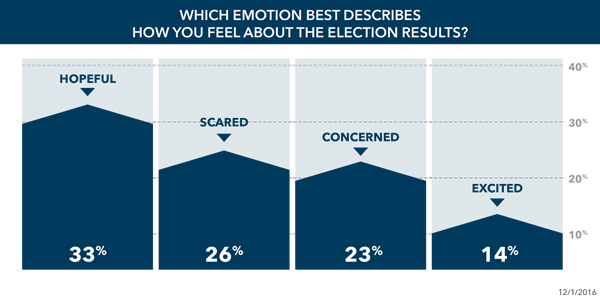 Voters’ concerns also showed in their feeling about the general direction of the country. Although the rating ticked up slightly, the public still sees it negatively. The percentage of those who think the country is on the wrong track fell from 63 to 58 percent. The amount of people who thought the country is headed in the right direction remained about the same (from 30 to 27 percent). President Barack Obama’s approval rating remained essentially unchanged from the last GW Battleground Poll, holding steady at 53 percent approval and moving from 44 to 42 percent disapproval. Democratic presidential nominee Hillary Clinton’s ratings moved from 45 to 42 percent favorable, and from 53 to 55 percent unfavorable. 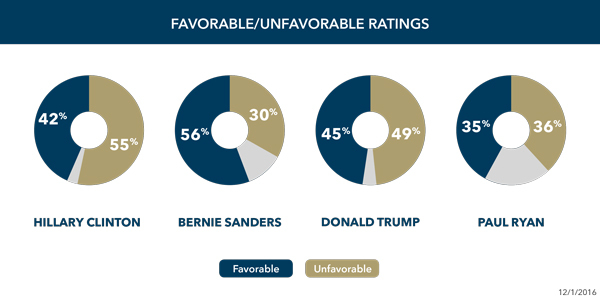 Senator and presidential primary candidate Bernie Sanders remains popular, with 56 percent of voters viewing him favorably and 30 percent unfavorably. Public favorability of Vice President-elect Mike Pence stayed the same at 44 percent, while his unfavorable rating grew slightly from 31 to 37 percent. His Republican counterparts were mixed: House Speaker Paul Ryan was evenly split (35 percent favorable, 36 percent unfavorable). Senate Majority Leader Mitch McConnell, on the other hand, struggled for relevance: he only received approval from 17 percent of the public; 33 percent disapproved of him, 25 percent had no opinion of him and 25 percent had never heard of him. New GW Battleground Poll shows a conflicted electorate.